Tarps come in all shapes and sizes. Most people have a few different types of them around their house, but still have no idea what the material is or how they are made. 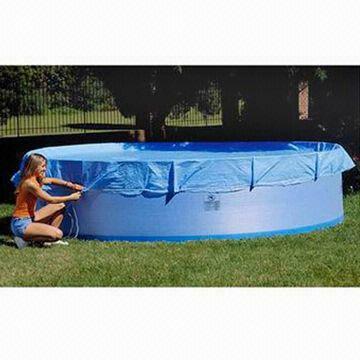 Poly tarps are very common and are made with a plastic material that makes them strong and waterproof. The Poly tarp usually begins with a nylon material that features a rope reinforcement all around the perimeter. This material comes in various densities, from low to high density. The low density material is most widely used because it is inexpensive, tough, though flexible, and resistant to chemicals. This polyethylene is not only commonly used in tarps, but in plastic bottles, toys, and food packaging. This synthetic fiber is a man made substance, created for durability and weather resistance. The fibers are woven together, and the material is cut into the designated size. After the basic material is made, the tarp is usually manufactured in a factory or assembly plant. Sometimes two pieces of material are used and bound together to create a very heavy duty tarp, but the most common types use a single layer, then sealing and stitching the edges to prevent rips and tears. The poly tarps are often coated with a number of chemicals at this point which will make it more heavy duty and also provide some specific benefits, such as mildew resistance, water resistance, UV resistance, and flame retardant. Grommets are also often added at this point. Brass grommets are the most popular as they are rust resistant and hold up well for long periods of time, even when used outside in inclement weather situations. These holes offer the perfect solution to allow the user to easily secure the tarp and tie it down as needed. They are usually implemented about every twenty four inches.